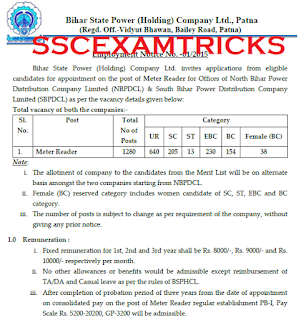 Bihar State Power (Holding) Company Ltd has invited online applications from 08th May 2015 to 22nd May 2015 for a total of 1280 Meter Reader vacancies in South Bihar Power Distribution Company Ltd. (SBPDCL) & North Bihar Power Distribution Company Ltd (NBPDCL) for the eligible candidates who had passed Graduation with Math/ Commerce from Recognized University. The candidates must note that only online mode for application is available. No other mode of application will be accepted. The age relaxation will be as per government norms. · Save and Print the application form & Send to application form with all testimonial to POST BOX NUMBER 12005; COSSIPORE POST OFFICE KOLKATA: 700 002 up to 02nd June 2015 till 05:00 PM. 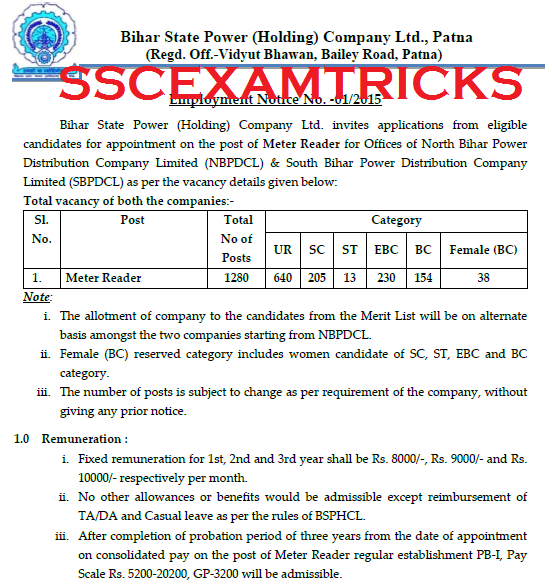 The Final Selection will be based on the performance in written examination for the Post of Meter Reader. The Written Examination will be conducted on 14th & 15th June 2015 by Pen Mode in which Objective Type Questions contains questions of various five sections up to 10th Level. The Written Examination will be Multiple choice question paper in which four options will be provided as answer and candidates will be required to choose one option as right answer. The minimum qualifying marks in the written test as per Government of Bihar norms, will be 40% for UR, 36.5% for BC, 34% for EBC & 32% for SC/ST/ Female candidates. 4. One set of self-attested of all the documents to the venue of interview. 5. 10th Certificate is used for Age Proof. 6. Address proof i.e. PAN Card, Ration Card, Aadhar Card, Voter card or Driving License. 7. Two extra colored recent passport size photograph (same as pasted on computer generated application form) required for application form or other document requirements. 8. Caste/PWD/EXS certificate to claim for seat available for reserve category. The Final Merit List of provisionally selected candidates will be released on official website.